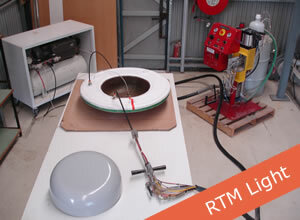 RTM is the preferred method in the small to large production of FRP (Fibre Reinforced Plastic). FRP components result in void free close tolerance and high strength ensuring precise measurements, while being smooth on both sides. RTM products are cost effective and produce minimal waste. The manufacturing process is fully enclosed which results in staff working in a safe and healthy environment within which the final RTM products are produced. FGS Composites optimises the RTM light process to its full advantage from small production runs to large ones. We can manufacture parts ranging from the smallest item to oversized parts that achieve a result of void free close tolerances, high strengths and smooth sides while ensuring precise measurements. At the appropriate time the clamping vacuum is released and the product is taken out of the mould. This is a process that can be repeated several times a day in the same moulds, thus speeding up production. Add temperature controlled moulds to this procedure and production can be quadrupled. For example, if we produce 5 products under ambient temperature and under heated moulds, we can achieve 20 products a day only using one set of moulds. Add more moulds again and it is possible to keep the injection machine running achieving uninterrupted use of injections which in turn results in more economical and efficient usage. Environmentally the RTM process is most favourable and results in less wastage. The fumes from the resins are totally encapsulated and the staff working with RTM Light need less training and in general are happier as they operating in a safer workplace. 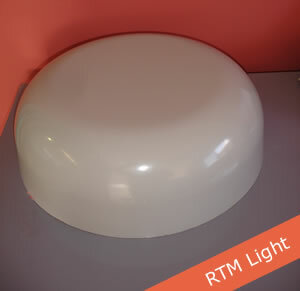 RTM Light is at the forefront in the manufacture of Fibre Reinforced Plastic products for all the great attributes as mentioned in this article.